Free MP3+G Karaoke Player and one Karaoke Song Included. Free Mp3+G Karaoke Player and one Karaoke Song Included. Song Manager 1.0 is included to assist in purchasing songs. Player includes Multiplex, Key Changer and Playlist management. Easy to use with many powerful features. Custom background rotation feature to change karaoke backgrounds, includes manual override. CDG Ripper 2.0 is an easy-to-use stand-alone CD+G Disc Conversion Tool. CDG Ripper is for converting CD+G Discs into MP3+G, MP3+G Zipped, or BIN. Power CDG to AVI converter is a tool that allows saving CD+G or Mp3+G track as AVI movie. That movie can later be used to play on any computer or you may further convert it to VideoCD-compatible MPG movie and record on on a VideoCD disc that can be played on any DVD player. Power CD+G to iPod Karaoke Converter will convert CD+G disc and BIN/Mp3+G files into iPod-compatible mp4 video files. "JustKaraoke" The Complete and Professional Karaoke Solution for the PC brought to you by TriceraSoft, the creators of the MP3+G Karaoke Format. 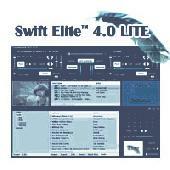 Swift Elite 4.0 LITE is a multimedia solution for the PC brought to you by TriceraSoft. Bring the Power of Video, Audio, Karaoke, Video Sources, and Effects into one awesome program. Excellent Player and Creator of file Karaoke K5 MID KAR KFN MP3 CDG CDA+G MP3+G WMA WMA+cdg for executions live without loss of time. CDGRip automatically Rips, Encodes, Zips, Names and Catalogs your existing CD G Tracks to Computer Ready Digital MP3 G Files! - New simplified User Interface with expandable Onscreen Preferences. SingSunflyPlayer is a software developed to assist the karaoke lovers play MP3 G Karaoke files on their PC. SingSunflyPlayer has as it's main components key and tempo controls, which can adjust the key and speed of the music playing. Convert CD+G karaoke to iPod karaoke videos. Use your iPod as a karaoke machine. Take your karaoke anywhere you go. Or get an AV-link, connect it to TV set, and play karaoke videos from your iPod. Convert CD+G discs and files to AVI and MPEG karaoke videos. Play karaoke songs on your computer, DVD players, or DivX-compatible portable devices. Make karaoke DVD discs from CD+G songs.